This morning’s action started with us trying to find somewhere to print Mark’s train ticket. He had booked on the internet from his tablet but is required to have a printed copy. Unfortunately we drew a blank on this, a year or two ago it would have been easy to find an internet cafe but today every one just uses their phones. A fast autoroute drive took us past Montpellier then a slower road to Aigues-Morte, an ancient walled town on the Rhone canal. I’ve been there before and it felt just as nice but I’d forgotten the busy commercial areas on the outskirts of all these towns. 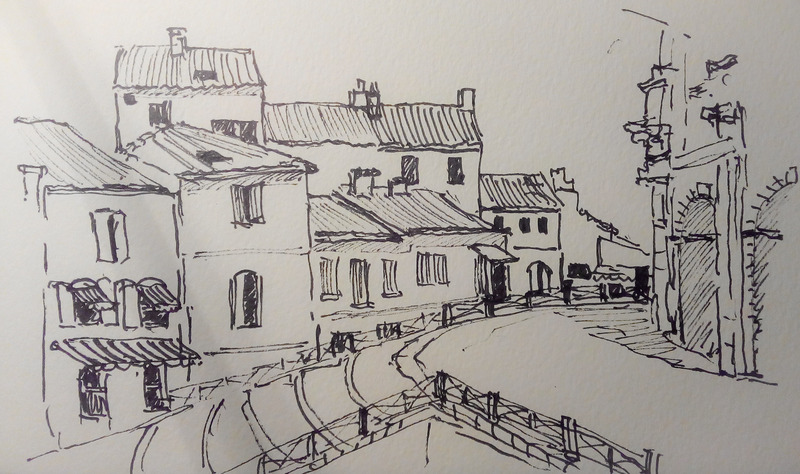 We had a coffee and I made a quick sketch before wandering around the town snapping photos madly. Or at least Quilliam was. Mark has been doing most of the driving but had a glass of red wine with his gourmet hamburger lunch so I drove across the Carmargue to Arles. Our, budget, hotel is 15 minutes walk from the old town of Arles and while I had a brief lie down Mark headed off and managed to get his tickets printed at an Algerian internet cafe. The French keyboard baffled him for a bit however. I met him in the town and we wandered up to the Roman Arena where we had a beer outside while I made a sketch of the buildings. A lot of people were queuing to get into the arena so we joined the line for what was described as a bull show. It was mostly a horse riding exhibition displaying the culture of the guardians of the Camargue. 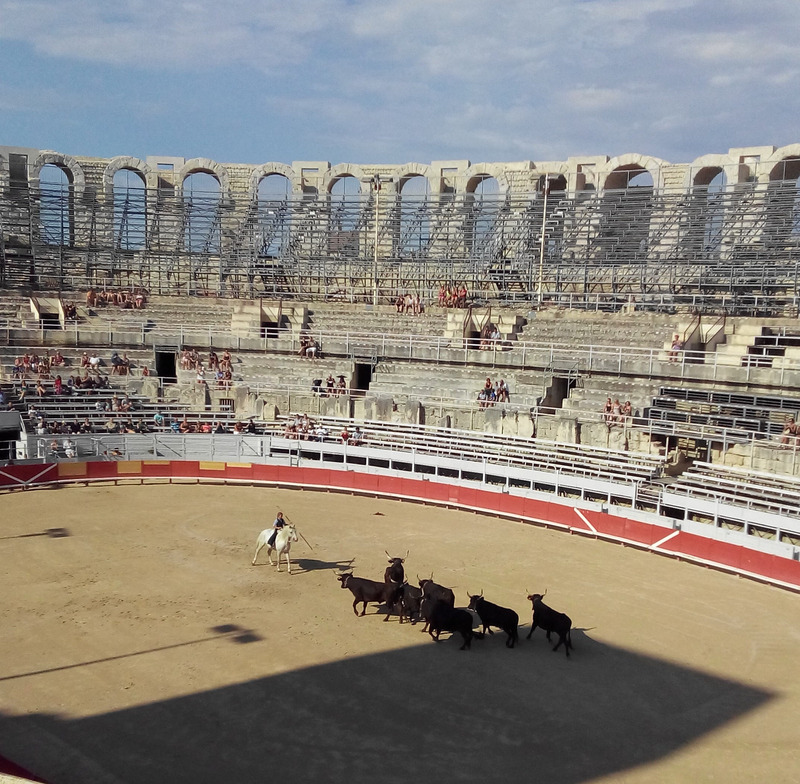 But there was a part of the show where an angry bull chased young men , dressed in white who jumped out of the arena to avoid being gored. Unfortunately, the bull also knew how to jump the first fence and repeatedly had to be enticed back into the ring. We ended up supporting the bull who clearly just wanted to go home. The rest, however, was a great spectacle in a fabulous place, Mark and I were imagining that almost 2000 years ago Roman citizens had sat on the same step watching gladiators or lions v Christians. Dinner outside in a nice square then the walk back to the hotel. 13000 steps today and the knee feels pretty good. Hi again, the Roman arena looks spectacular, and reminds us of that tv. ad. for a wide screen “surround” tv! It must be great to actually see these wonderful ancient structures.